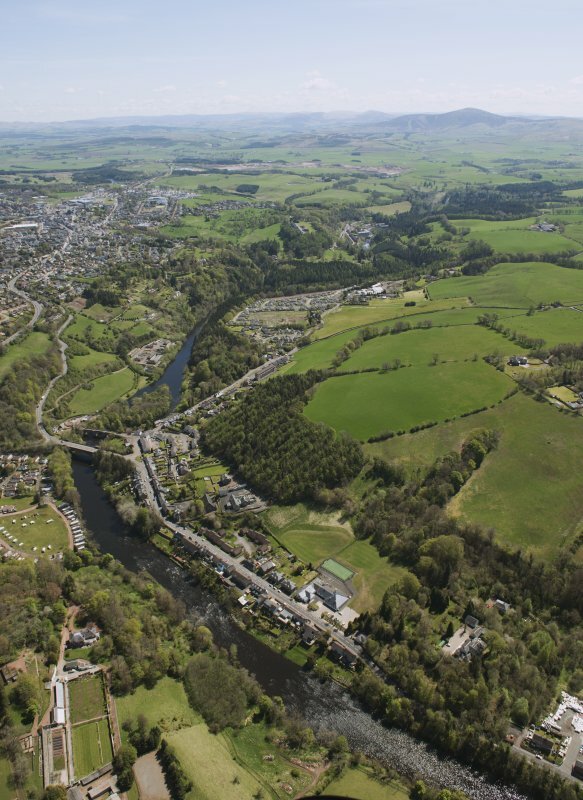 General oblique aerial view of the Upper Clyde Valley centred on Kirkfieldbank Village, looking to the SE. Detail of one span from west. View from south end looking NE across the bridge. 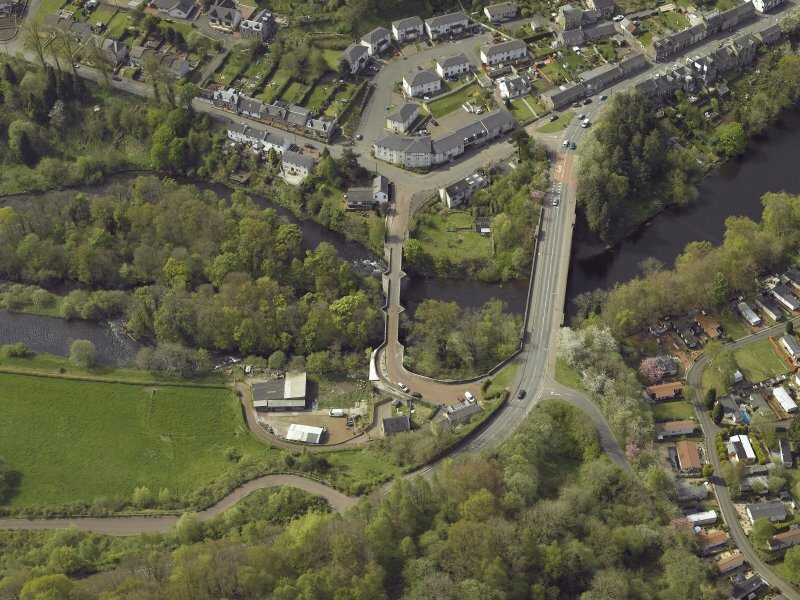 Oblique aerial view centred on the bridges, taken from the SE. 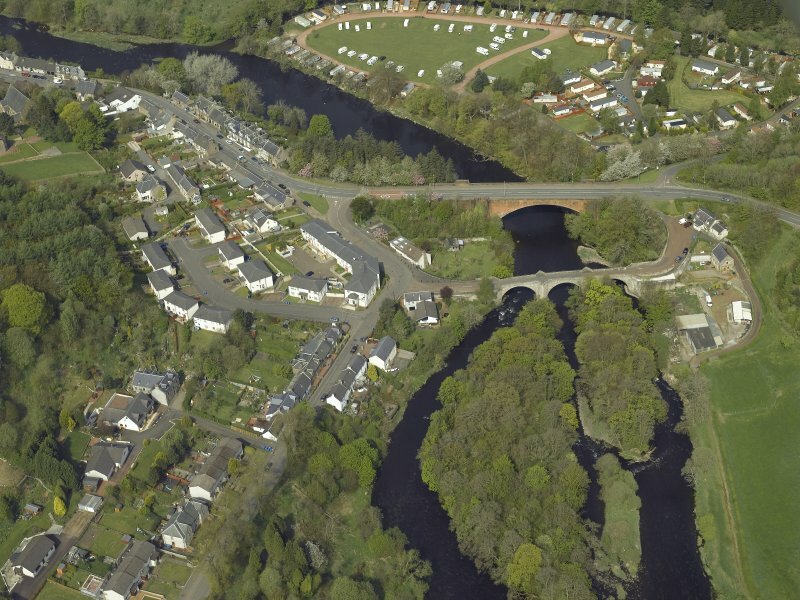 Oblique aerial view centred on the bridges, taken from the E.
Oblique aerial view centred on the bridges, taken from the NNE. For (successor and present) Kirkfieldbank Bridge (adjacent to NW), see NS84SE 136. 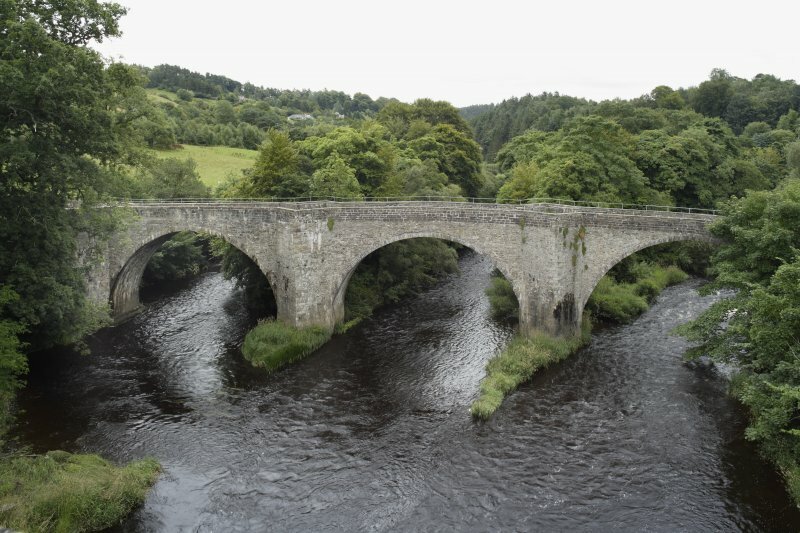 Name: 'Lanark Old Bridge' obsolete (J Arrol, Div Road Surveyor, Lanark). 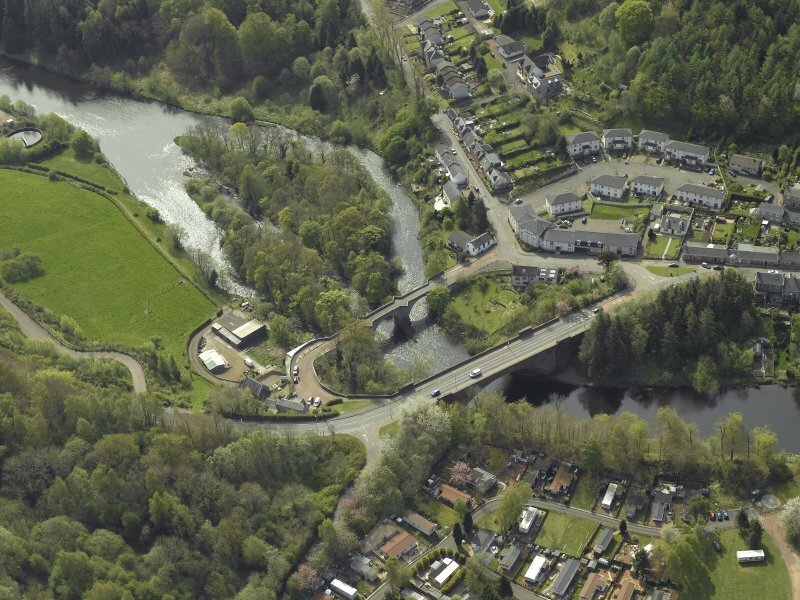 In 1696 work began on the construction of a bridge at Clydesholm which was completed in 1699. The plan was first mooted in 1649 but was abandoned. 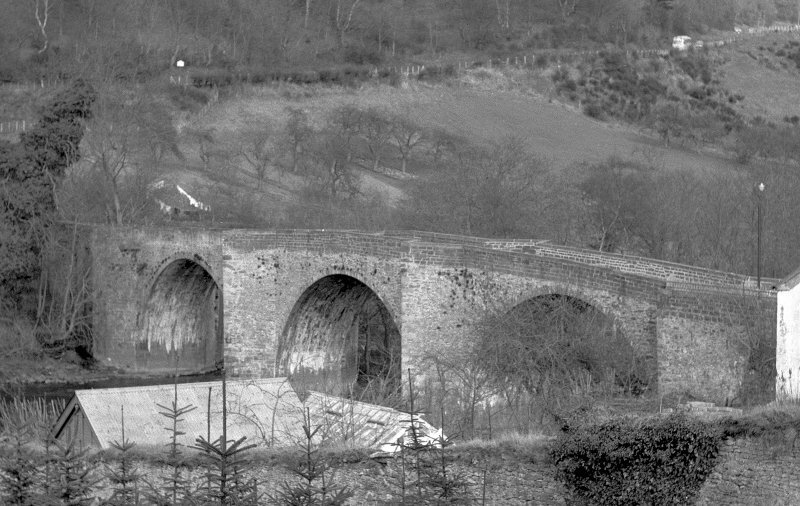 A narrow, three-arched bridge of squared masonry spanning a deep valley. In good condition, approximately 4.0m wide, with cut-waters up- and down-stream. 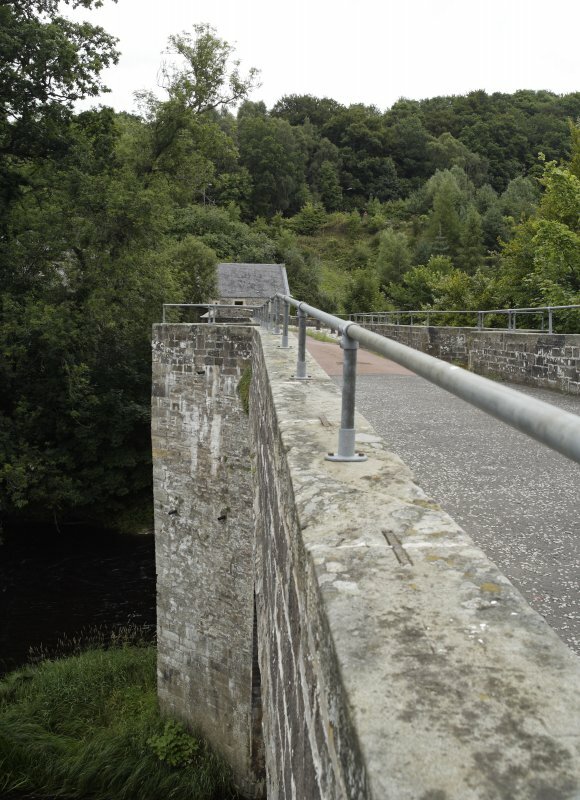 This bridge has been superseded by a modern bridge erected in 1959, but it is still used by pedestrians. (Location cited as NS 869 439). 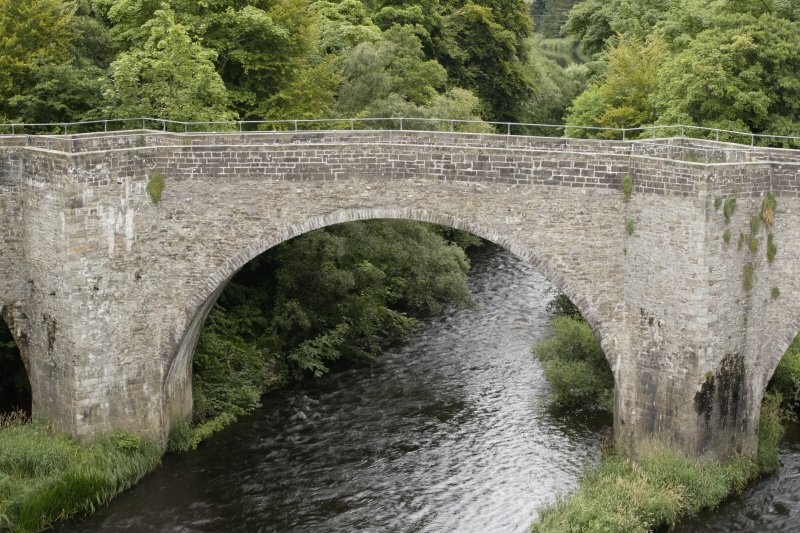 Clydeshom Bridge, Kirkfieldbank, built 1694-9. A very attractive 3-span rubble bridge, with semicircular arches, and triangular cutwaters extended up to form pedestrian refuges. Now bypassed and used as a footbridge. 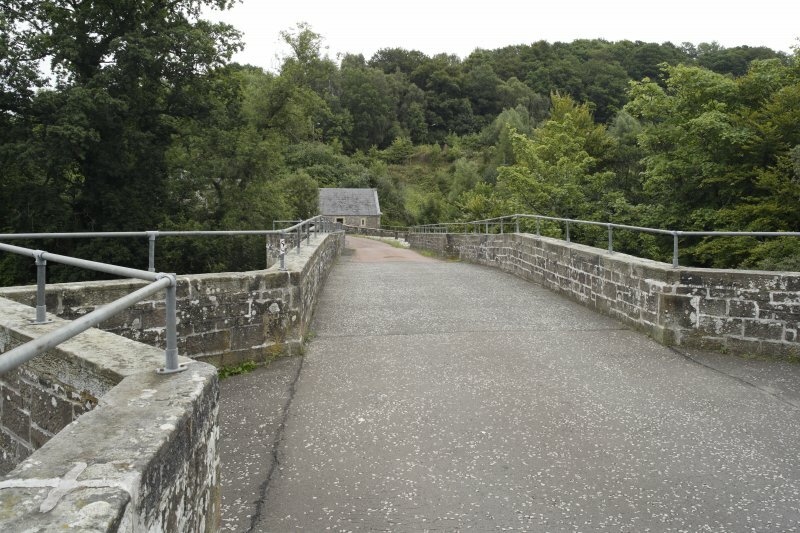 This bridge carries the former line of the A72 public road over the River Clyde to the W of Lanark (NS84SE 75). 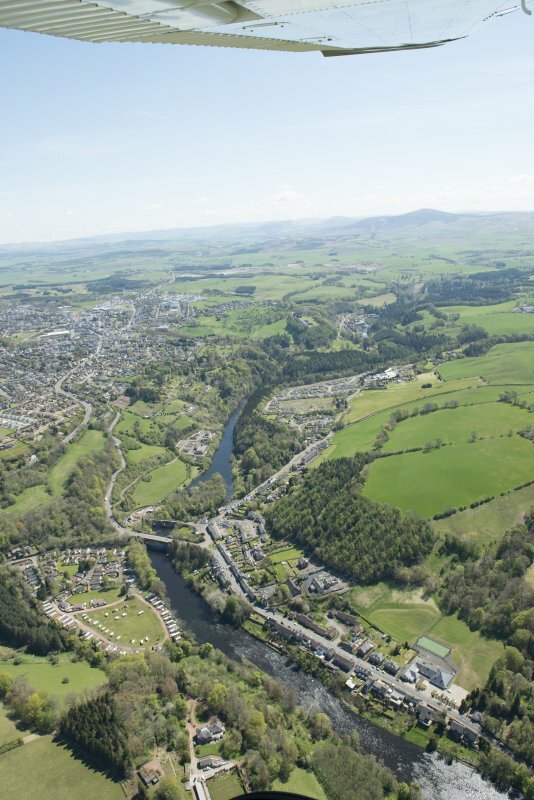 The river here forms the boundary between the parishes of Lanark (to the NE) and Lesmahagow (to the SW). The location assigned to this record defines the centre of the structure; the available map evidence indicates that it extends from NS c. 86844 43891 to NS c. 86899 43946. 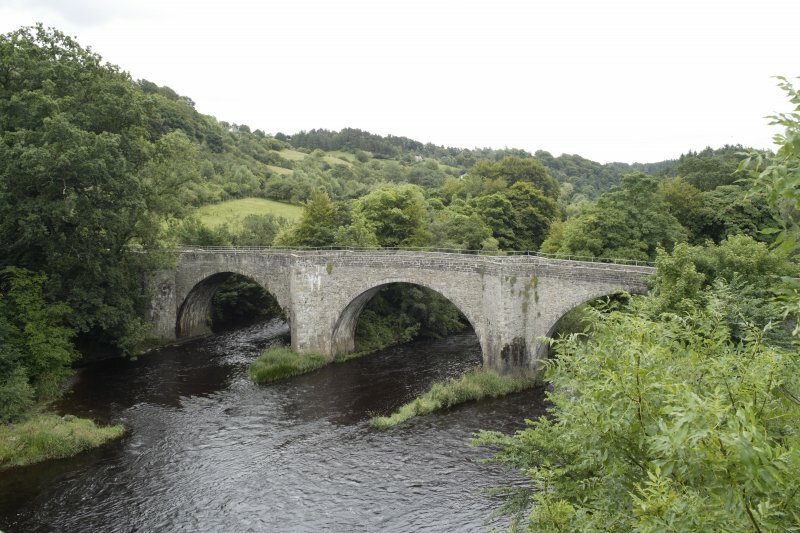 17th century bridge for which evidence survives of payments for building. 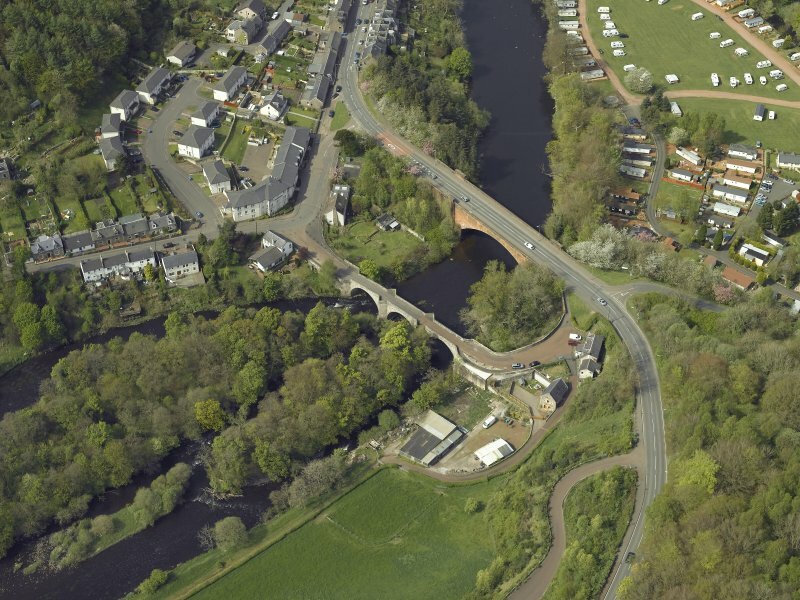 An impressive three-span mainly rubble masonry bridge erected over the Clyde from 1696–99 with near semicircular arches of 60 ft span and triangular cutwaters extended up to form refuges. Its roadway is about 50 ft above the river. The designer and Master of Works was a Mr Lockhart of Birkenhead, Lanark. 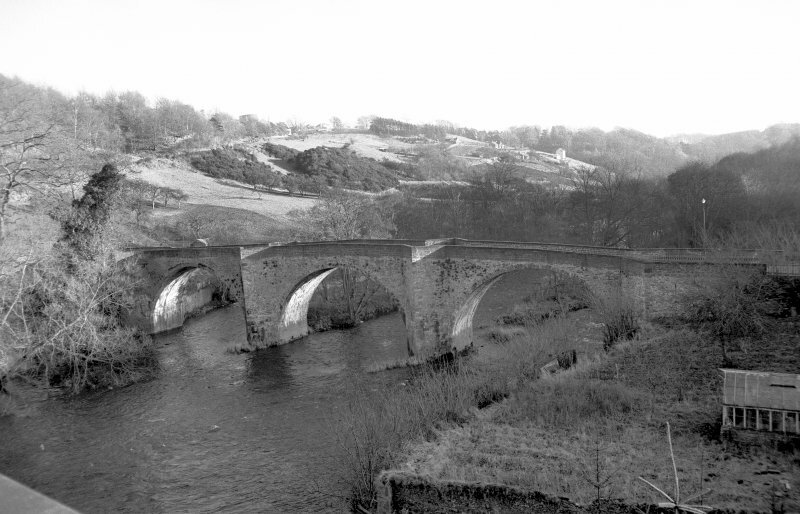 A fine example of late-17th century bridge building largely by direct labour, for which contemporary details of disbursements exist. The Master of Works received a salary of 20s per diem and in 1699 ‘fiftie merks Scottis as a gratuite for his good service at the bridge’. Now used as a footbridge.